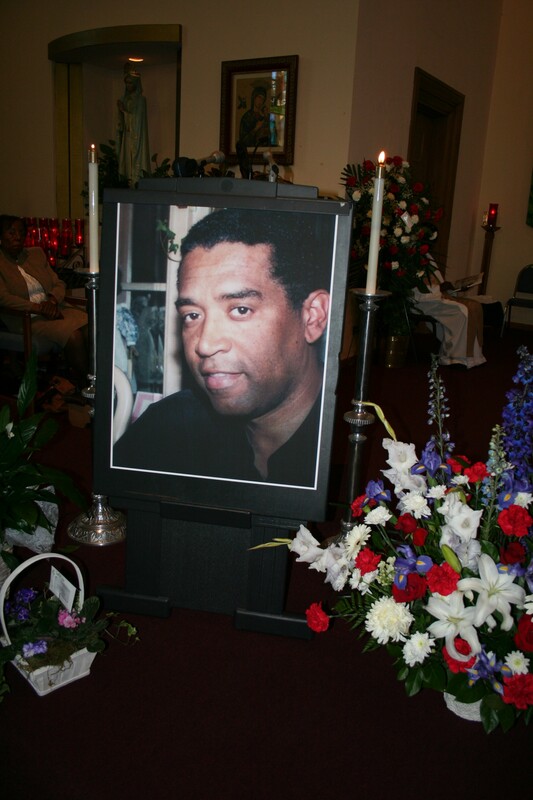 On the murky day of Aug. 8, Black Oakland remembered the life of career journalist Chauncey Bailey, who had been murdered the week before on a downtown Oakland street, going to work at about 7:20 in the morning. Hundreds of people filled every place imaginable in the East Oakland Catholic Church of St. Benedict. Bay Area Black media was there in force, from Willie Ratcliff, publisher of the San Francisco Bay View, Paul Cobb, publisher of the Oakland Post, Maleena Lawrence of the Maleena Lawrence Show, Harrison Chastang from KPOO News, Gail Berkley, formerly with the Oakland Post and now with the Sun Reporter, Malcolm Marshall from Street Soldiers on KMEL, to Kevin Weston of New American Media. Adding the unusually large number of representatives of the corporate news, the total of media people was well over 100. Black politicians seated in the front row included Mayor Ron Dellums, Congresswoman Barbara Lee and Alameda County Supervisor Keith Carson. Everybody was there, from gospel singers who sang during the program to the Nation of Islam who helped with security to Chauncey Bailey’s cousin, rap music executive Chris Hicks, who is responsible for the careers of the Luniz and Dru Down. Although I often disagreed with Chauncey’s political stances, I still saw him as a colleague who was sincere about what he wrote and shared on TV, when I used to watch him occasionally on Soulbeat. He was a journalist who was out there in the streets trying to get the story rather than waiting for the subject to walk through the doors of the Oakland Post. Two months before his unfortunate murder, he covered a story on my eight months pregnant girlfriend, who had been laid off from her job at College Track, a non-profit organization for youth services, when it was discovered that one month later she would be eligible for benefits. His story helped to raise awareness about non-profit executive pimps with six figure contracts who continuously skim resources from our youth and employees to line their greedy pockets. We sincerely appreciated it. Members of Your Black Muslim Bakery have been charged with murdering Chauncey Bailey in a case that is plagued with questions. Approximately 21 hours after Chauncey’s life left his body on the concrete in Oakland, SWAT teams raided Your Black Muslim Bakery and, according to reports, three other houses, resulting in the arrest of 19 people called “suspects” in the media, including the young leader of the group, Yusef Bey IV, another brotha in the community whose work I know of personally. How convenient. When I was awakened the next morning after Chauncey’s murder to my phone ringing off the hook, caller after caller called talking about how the “Muslims” were responsible and they knew it all along. When I turned on the TV, I literally was watching corporate media flex its brainwashing power to manipulate people’s grief, love for Chauncey and need to feel safe into a white lynch mob mentality against Your Black Muslim Bakery. The topic was on everybody’s lips. When I went to get my hair cut in downtown Oakland, that was the only subject that we talked about while I sat there for over an hour. When I went to the Cornelia Bell Gallery in West Oakland to be a part of Emory Douglas’ art opening, there was a little gathering outside talking about the week’s events. Everybody had an opinion, but no one had any facts except what the corporate media said – and that was directly coming from the police. The Black Panther Party followed the motto, “No investigation, no right to speak.” As far as I know, no one to this day has pursued a people’s investigation into who killed Chauncey Bailey and why. TV news kept showing video footage from a couple of years back, when Black individuals in bow ties filed into liquor stores destroying the alcohol sections. These liquor stores are predominately owned by Arabs who don’t allow their own people to consume the poison that they sell to the Black community. Another aspect of the media job engineered around Chauncey Bailey and Your Black Muslim Bakery included creating a motive. The motive they engineered was, in effect, that “the Muslims killed him, because the latest story he was writing was a damning story about their financial problems.” Somehow, they imply, people from the bakery got wind of the story before it was published. The story remains unpublished. The motive doesn’t line up to me, because a few years back the East Bay Express wrote some vicious cover stories on the organization three weeks in a row. The writer remains unharmed. I know for a fact that one of the last stories that Chauncey was working on dealt with the police extortion or attempted extortion of Black owned performance venues in Oakland’s downtown, including Sweet Jimmies, On Broadway, the old Jahva House, Bluesville, Cafe Axe and the Caribe. Somehow, some way with all the coverage on Chauncey and Your Black Muslim Bakery across the world, this fact has never – I repeat, never – come up in the media. I know about this story, because I know people he was interviewing. Chauncey was killed in the same downtown that he was talking about, in broad daylight, during morning rush hour, on a street that is usually swarming with police by a murderer who got away without even a chase. Am I the only one that this looks strange to? Now, the police and corporate media are saying that they have a “confession from the murderer, who is a handyman in the bakery turned assassin.” If that is the case, under what conditions did the “murderer” “confess”? With the San Francisco 8 on trial in San Francisco and Minister of Defense Aaron Patterson on trial in Chicago right now in cases that involve police torture, I know how the police get down on Black people. I don’t claim to know who killed Chauncey Bailey, or for what reason. Like what we say in the Prisoners of Conscience Committee, we as a community must deal with the case objectively and research the facts for ourselves. The corporate media can’t be liars in Iraq but be credible when it comes to the Black community. The police lie about almost everything that goes down in Black communities across this country, but on this one they’re telling the truth? We must remain consistent in our refusal to accept our enemies’ perception or definitions about what happens in our community, realizing that the perception that they put out has a political agenda connected to it. Howdy! I could have sworn I’ve visited this site before but after looking at many of the articles I realized it’s new to me. Nonetheless, I’m certainly delighted I came across it and I’ll be book-marking it and checking back often! Looks interesting cant wait to try it !!! .. thanks sir for share it with everyone. Support animal rights !! FREE O.J. !!!! !